Well I finally got both the nerve and the opportunity to align so I could ask Grandpa about his Russian stash. He liked the shirt I got him for his birthday and asked how I knew and I used that as the path to explore my curiosity. Now, understand that I have to somewhat “paraphrase” his answer as his language is, well, salty at times. Why did he collect them – “was he planning to start his own militia? Was it that crazy commie President Truman? After learning to shoot one these he was going to keep his freezer stocked in venison FOREVER? Grandma wanted them?” I threw all of those out as he likes it when I go a little off the deep end. He smiled and provided a story so sweet that this vet gained a deeper understanding of what family was about. 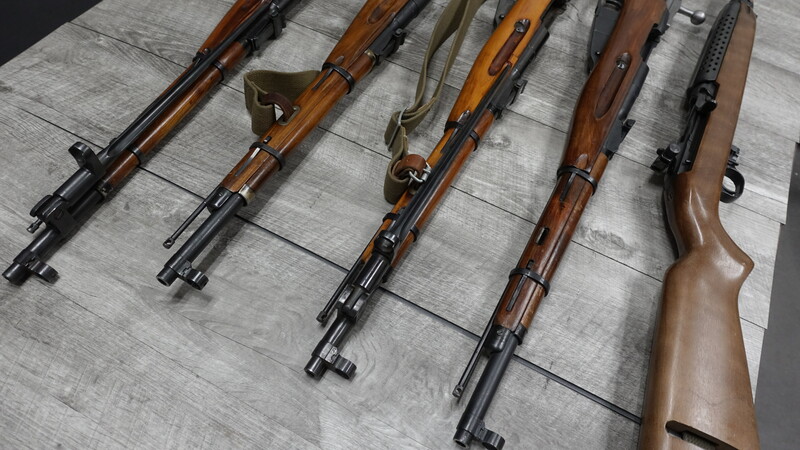 He said his father had purchased them, one for himself and one for each of his three sons over the span of a few years and these were the weapons with which they were all taught to shoot and hunt. Something they did together and often growing up. Receiving one was a right of passage to adulthood within the family. His dad chose these for the obvious reason, they were cheap and available and accurate and an expense he had to justify to his wife by putting meat in the freezer. Of course Grandpa was sad that he had them all now as it meant he was the last surviving brother, though not the youngest. Obviously they are special to him and he claims that he can put a story behind almost ever scratch and mark and that he knew which one belonged to who on sight. Then again, he still insists Big Foot is real, mostly I suspect, to drive us crazy. And I did get permission to go to the range as long as he could tag along and as long as I was willing to spring for dinner afterwards. Amazing how empty sports bars are at 4:00 pm on a Tuesday. After slowly and with much discussion getting past the fact that they don’t have a 55+ menu, and that there are no ordinances against it, even in states like Florida, New York and California (well, not yet anyway). We talked more about his collection, about the men who owned them, and about family. I will remember that conversation as long as I live. 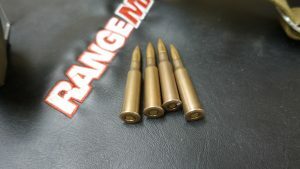 As to the rifles, well, that Russian 7.62 x 54R stuff looks pretty scary after firing American and European made ammo for a lifetime. It isn’t pretty and it isn’t shiny but it operated just find in these old beasts and it hit where I thought I was aiming. The round off to the right in the above picture was the first one I shot, while wearing ALL the normal safety gear – double hearing protection, soft wads under earphones, shooting gloves and shooting glasses, and with my face NOT pressed against the weapon and not looking down the barrel and aligning the iron sights. This was my “will it blow up” shot. It didn’t. If I could have safely pulled the trigger with a 10′ string from behind a barricade I would have. My fears were unfounded. This old beast was smooth, gave me a good grouping after a few adjustments to my sighting posture, and the bolt racked fine, considering its age, with rounds inserted into the open chamber. It had minimal kick, less than my Henry’s 44 or my Browning .308, both lever actions. 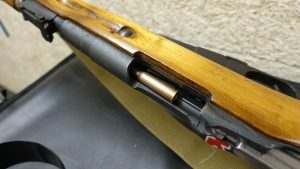 The real wood feel of the stock was secure and firm. We should all perform as well 74 years after we were made. 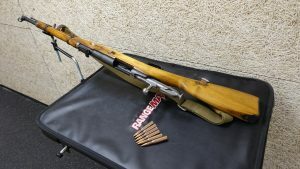 I asked how long it had been since it was fired last – 32 years! You bet I wished I had asked that BEFORE I squeezed off that first round. And yes, I did ask what he shot it at in 1986, and he said a rabbit at 30 yards. He claims to still have that rabbits foot which was the only recognizable piece he found. The rounds were a bit hard to cycle through the clips, they are showing the wear from not only a lot of use but a lot of years. My attempts at doing “rapid fire” with just three rounds were jerky at best. When Grandpa did this he used a smooth and steady rhythm and well, he did better. 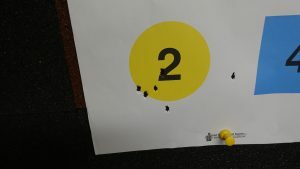 BTW, that round in the “2” in the target picture above is his. I think one of the rights of passage is when we mature enough to seek out our elders and to learn from their life experiences. There are no apps that provide this.